Come visit us at Ban Thanyanan and stay at our peaceful and lovely resort. 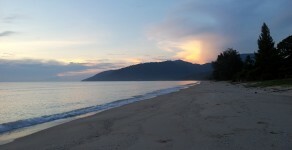 We are located in a quiet small village near unspoiled Nadan Beach and one km only from Khanom city center. Ban Thanyanan Hotel Resort offers quiet and peaceful 3 villas. Each villa has a fully furnished living room, bedroom, kitchen and bathroom. Ban Thanyanan Hotel Resort offers quiet and peaceful rooms. Each room has a fully furnished bedroom, bathroom and optional kitchen. Nadan Beach is just a 5 minute walk from the resort, offering mirror like water and coconut trees. The resort is located near beautiful Nadan Beach, only a 5 minute walk and you are in a tropical beach with mirror look like water and coconut trees around. Ban Thanyanan is a new hotel resort located near Nadan Beach in Khanom, Nakhon Si Thammarat, Southern Thailand. Our hotel offers 3 villas and 6 rooms, equipped for your short and long stay needs and convenience. Our commitment is to make our guests most satisfied. We at Ban Thanyanan believe that a satisfied guest will come again. Our team is there to help you with a staffed 24/7 front desk and free daily housekeeping services. We put our best efforts to make sure you enjoy your stay with us.